Follow these core tenants of exercise selection to maximize gains in size and strength. On JimStoppani.com, I offer full programs ranging anywhere from one week to three months in length. Each of these programs tells you exactly what to do down to every last exercise, set, rep, and rest period. That said, one of my core missions is to help educate people on how to train effectively. To truly get the most out of your workouts, you need to know more than what you should be doing and how to do it – you need to know why. Through my articles and programs, I want to teach you everything I know so that you can design your own programs yourself. After all, a workout shouldn’t just be getting you in better shape and improving your health; it should be teaching you something as well! When it comes to program design, there are a handful of basic concepts to take into consideration. The first deals with your training split – your weekly routine or schedule. I covered this topic in my How to Find the Right Fitness Routine article here on GIJobs.com, so be sure to take a look at that. Which exercises are you going to do? How many sets of each exercise will be done? How many reps will you do per exercise? How much rest will you take between exercises? There are other variables to consider as well – for example, intensity-boosting techniques like supersets and circuits – but exercise selection, volume (number of sets), intensity (number of reps), and rest periods are the key ingredients to a workout. I’ll cover all four of these areas here on GIJobs.com, one at a time. First up… Exercise Selection. If I had to sum up my philosophy on exercise selection in one word, it would be VARIETY. People ask me questions all the time, like… What’s the best exercise for getting bigger arms? What’s better: barbells or dumbbells? Should I use machines or not? Look at any program in my Train With Jim series on JimStoppani.com and you’ll see exercises for all 10 of these muscle groups on more or less a daily basis. Bigger body parts (chest, back, legs) may be prescribed more sets than smaller ones like traps and forearms, but again, it comes down to proportion and balance. For me, no muscle is overlooked. Scientifically speaking, there are three anatomical planes of movement: the sagittal plane, frontal (or coronal) plane, and transverse plane. Your program should encompass all three planes of movement on a regular basis. In terms of lifting exercises, movements fall into two broad categories: compound (or multi-joint) and isolation (or single-joint) exercises. The definitions of these categories are simple. With compound exercises, action occurs at two or more joints; with isolation exercises, action occurs at only one joint. Compound exercises include “big” movements like presses for the chest and shoulders; rows, pulldowns, and pull-ups for the back; and squats, lunges, step-ups, and leg presses for the legs. Isolation exercises include flyes and cable crossovers for the chest; lateral raises for the shoulders; straight-arm pulldowns and pullbacks for back; leg extensions for quads; and leg curls for hamstrings. For small muscle groups (triceps, biceps, traps, forearms, calves, and abs), a majority of exercises will be single-joint (isolation) moves. Similar to training all muscle groups of the body, both types of movements should be utilized throughout your program. For examples of compound and isolation movements for all 10 major muscle groups, see the below “Compound vs. 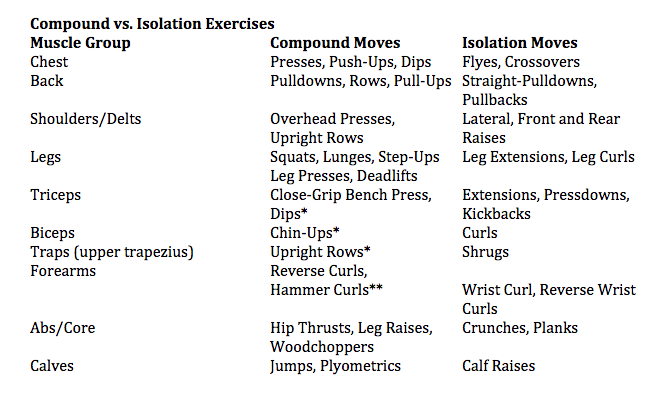 Isolation Exercises” chart. You should also incorporate as many different angles of movements as possible. Even slight adjustments like lowering the incline one notch when doing dumbbell presses on an adjustable bench, or using a slightly different grip on the bar when doing lat pulldowns, will hit the muscles in different ways to keep them from adapting and plateauing. 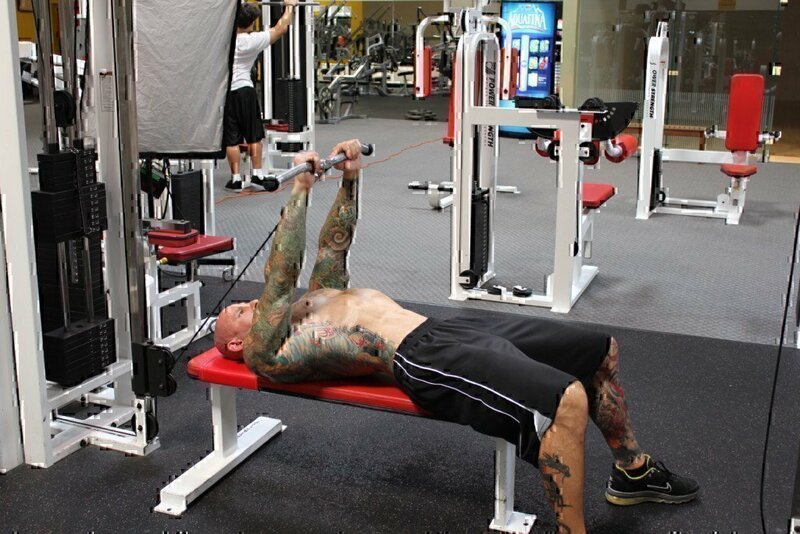 For examples of different angles to use on exercises, look at my Small Angles for Big Gains program on JimStoppani.com. *These exercises also hit other larger muscle groups (back with chin-ups, delts with upright rows, chest and delts with close-grip bench press and dips). **Reverse and hammer curls are technically not compound moves, but they can be loosely considered that in the context of training forearms because the biceps are also involved in this movements. I don’t have one favorite piece of equipment. I’m not partial to dumbbells, I don’t favor free weights over machines (or vice versa), and I’m not a “kettlebell guy.” I use them ALL. Again, it comes down to variety. Plus, different pieces of equipment provide different types of resistance and movement patterns. For example, cables provide continuous tension through the full range of motion, whereas free weights (barbells, dumbbells, kettlebells) have certain “dead spots”; selectorized machines and Smith machines move the weight along a fixed path of motion, while free weights allow for greater freedom of movement; elastic bands provide what’s called linear variable resistance, where the tension increases the more the band is stretched, and so on. This list doesn’t even cover it all! I could go on and on. The point is, use anything and everything you can get your hands on in terms of equipment. Your muscles will be in a constant state of confusion – and confused muscles are growing muscles! When discussing exercise selection, a natural question is, “How many exercises should I do per muscle group?” The short answer is, anywhere from 1-5 exercises per, depending on your training split. Now we’re getting into the topic of training volume, which I’ll cover in a separate article. Before I wrap up this article, let me just say one more thing: Don’t listen to anyone who says a particular exercise is “worthless” or “nonfunctional.” When performed with proper technique, all exercises serve a purpose. Free weights, machines, compound moves, isolation moves, bands, strongman implements, you know name it. When it comes to exercise selection, your training program should be all-inclusive! In order to get the most out of your workouts, you must train properly and be smart about your exercise selection. Dr. Jim Stoppani talks about what to consider when preparing a workout.